Home » Retirement » How to do Successful Retirement Planning? Today everyone wants happy and healthy retirement life, but very few people do planning for the same. If you are one of them it’s time to do retirement planning. Please refer to our previous article to know how much money is required for your retirement. 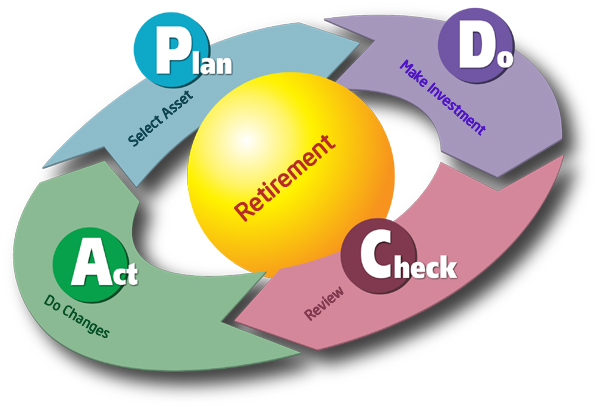 Once you come to know about requirement of your retirement fund it is time to work towards achieving same. Here is systematic way for retirement planning. Step -1 Determine how much money you can invest for retirement? First step in doing retirement planning is to determine how much money you can invest for retirement on monthly basis. As you know your monthly income and expenditure you can easily figure out this amount. Once you know this amount it is time to select asset class for investment. Second step in doing retirement planning is to select right asset class for investment. You need to select asset class based on your risk appetite. Make sure you consider equity and debt both for investment. Consider past performance and other factors like benefits and drawback before making selection of asset class. Advisable investment for retirement is PPF, Equity & Mutual funds. Avoid taking retirement plans. Diversify your investments & reduce risk. Once you are through with selection of asset class it’s time to do investment. Rather than doing lump sum investment at single go, it is advisable to do systematic Investment on monthly basis. Make sure you are disciplined in doing this investment if not, you can plan to adopt automatic SIP option. You need to regularly review performance of asset class. If asset class is not performing up to make you need to make appropriate changes in investments. Follow steps given above and I am sure you can achieve happy retirement life. Simple graphical representation above steps (PDCA) is given below. Start Early – Sooner is better. You need to start preparation of your retirement at early age. The simple fact is that if you start saving early, you will likely to save more. Another reason for starting early is your investment will have more time to grow (power of compounding). Inflation – Inflation kills. Inflation rate is very important factor for retirement planning. Inflation rates keep on changing. Higher the inflation rate means more money is required for retirement. Invest in Health – Health care expense is likely to rise as you grow older. You should start investing in health from retirement prospective. I suggest to go for health insurance policy along with retirement planning. This will help in reducing unlikely expense on health during retirement. Hope above stuff will help you in retirement planning. Do share with us your thoughts in the comments below.